Have you recently just invested in a new kitchen? If you have then you will want it to be kept in pristine condition. At Lister Glass, we know that you would want your kitchen to look stylish but at the same time you need it to be practical. There are many things you can do to a kitchen to protect it from ‘wear and tear’ but the main item you should consider is a glass splashback. A glass splashback can be considered a necessity if you want to keep your new décor intact, it will protect it from splashes of food that are unavoidable when cooking. 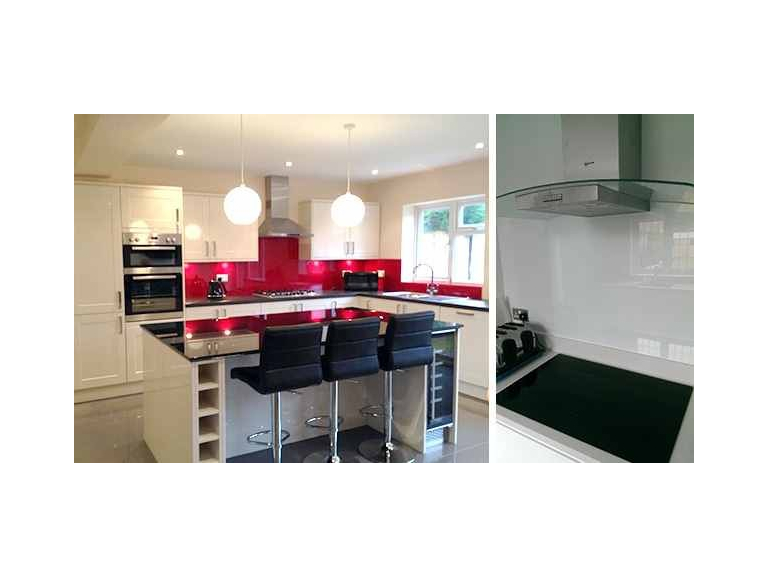 You may be worried that there is any extra cost involved if you decide to choose a glass splashback, but at Lister Glass we think protecting your kitchen for years to come is worth it. Also this month we are offering a free fitting on all splashbacks booked before the end of October, hopefully this offer will make your decision a no-brainer. There are so many different materials used to create splashbacks but glass alone has many more benefits. If you are worried about finding a glass splashback to fit your style of kitchen, don’t be! There are so many varieties available including classic clear glass, glittered glass, black glass and many other colours. Whatever colour or style you want we are sure we can create it out of glass. Not many other materials will give you the same choices. Do be aware that if you do choose a rare colour this could have an effect on the price. If you are looking for a splashback that is super easy to clean and will help to keep your kitchen low maintenance, you should choose glass. Glass doesn’t take much work, you can simply use a damp cloth, warm water or even washing up liquid to clean this type of splashback. It will take minutes and will look shiny and new in seconds! This is great for kitchen maintenance, as once the glass splashback has been installed there will never be another cost incurred from up keep. If you don’t have a standard size kitchen don’t worry. Glass splashbacks can easily be cut to size, this means you can also customise your splashback. If you want it to cover more of a particular area, for example more than just the space near the hob, we can do this! Also if you do have a traditional sized kitchen you may find the glass splashback comes at a lower cost. Glass splashbacks are widely available, you will never find it difficult to find a range of glass splashbacks to choose from. This will ultimately work in your favour as you will always be able to find a specific style and a good deal. All of the points we have mentioned (widely available, low maintenance, variety of styles) all contribute to making glass splashbacks very cost effective. If you compare any other material such as marble or granite splashbacks to glass, glass will always win. And just because it is cheaper doesn’t mean you compromise on quality. Glass has always been recognised as a high quality material and will add a contemporary look to any kitchen. Choosing not to install a splashback is ultimately only going to end one way, a very dirty/tired looking kitchen. You will never be able to avoid spillage and you should be able to enjoy the space you cook in without the worry of destroying the paintwork. Call our team today for help choosing the style and size splashback you want! Don’t forget at Lister Glass we are offering a FREE FITTING on all splashbacks booked before the end of October! All you need to do to enjoy this deal is to QUOTE ‘THEBESTOF EPSOM’ when you make your booking with our team. Call us today on 01372 744 427 or email us on info@listerglass.com for a free quote.